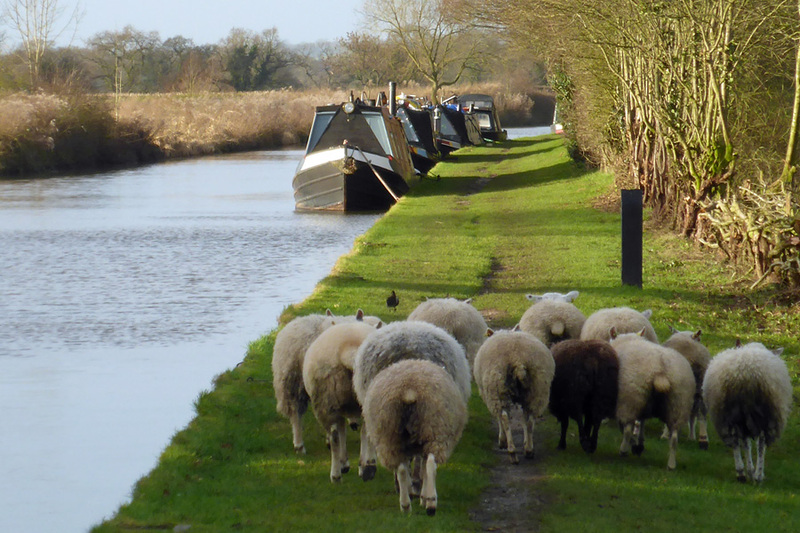 Chasing sheep with a small orchestra #narrowboat #England – The Diesel-Electric Elephant Company. Ever wondered what happens when one’s orchestra chases sheep along a canal towpath? Well, wonder no longer. Last evening’s high winds of 40-50mph obviously had an emotional effect on these sheepsies, moving them to, well …move. My first discovery on this morning’s perambulations was that I still had my slippers on. My second discovery, on going back aboard to change into some shoes, was that I had forgotten to dress. Back aboard, third time lucky and I set off on the usual route – and that was when I discovered these beauties, all trying to get through the gate at the Cholmondesley lock and onto “Insanity Lane”. Well, as many of you, the Society of Genealogists, and Inspector Crotchfiddler of the National Perpetual Offender’s Unit will already know, I am three-quarters Welsh Collie – so naturally, my first and only instinct was to round them up. Mind you, I do think that perhaps I shouldn’t have pretended to ride a hobby-horse and shouted “yes indeed, my lovelies” at them. Even the sheepsies were a little contemptuous of that. Dropping to all fours, running around and barking at them was probably a mistake too. They all showed me their opinion of my technique in the customary manner. I do have to say though, folk oftentimes criticise English farmers, but these were the easiest, most bestest-haved sheep that I have ever had the pleasure to round up. The ladies all went back around the bend (as do we all at some point in our lives), up the bank and back into their field. They are milling about there now to await fattening and then a final visit to the whirling blades of the abattoir and, plop – onto the plates of you omnivors. Mint sauce, roast potatoes and cabbage if you’re local, or probably “French fries” and mayonnaise if you’re foreign, or otherwise trapped on the wrong side of the channel. It is so very sad that so many of you are trapped abroad. I do think of you every day, and hope that life isn’t too terrible for you all. Are any of you in countries that have the bucolic? We used to be able to send a lot of the bucolic abroad, but of course we’re not allowed to now that the The Empire has been “discontinued due to lack of local co-operation”. Still, chin up, chaps, I’m sure that it’s just lovely where you live too and, if it isn’t, well – hah-hah! The rest of the day’s stroll was quite uneventful really. A footpad here, a challenging cove there (both dispatched with the aid of my trusty sword-stick, a present from my dear late Mother on the occasion of my tenth birthday). Much sunshine (gone now – back to eight-eights cloud cover) and much fresh air was had by all. Most splendid, most splendid indeed. Back now to the Cardinal for, methinks, a reward of a nice, hot, vegetable curry with rice and perhaps a bottle of beer. IGH. Qualified Sheepherd as well as Boatist, available at reasonable rates throughout the lambing season (after which unreasonable rates apply). Those Jeté-ing ladies are hysterical! Almost in time with the music, but not quite! Parcel should be with you tomorrow, or possibly some other day of the week. I’ve photoshopped lingerie onto some of the more outrageous examples – I had to; they said that they couldn’t let me send them through the Royal Mail otherwise, just in case the wrapping came loose at each sorting office and local depot. I couldn’t get brown wrapping, so it’s a sort of taupe with overtones of mud-white and undertones of burnt khaki. Apologies. Dear Son, your dad and I continue to suffer very bad with the bucolic yr dad is sad poorly with it I refer of course to us as your mum and dad although we continue to be no relation to you. The local bottoms here are cow ones and the occasional goat but very seldom sheeps, so thank you for the informative and picturesque pictures. Tell the inspector your dad says hello ah old times, eh? Somehow a goat’s bottom just isn’t the same, is it? They don’t wiggle properly, and they look ridiculous in high heels that a sheep can carry off with no problem. What fun! You chose the music well, I thought. What a wonderfuel collection of sheepes bottoms and not a jar of Colman’s mintus in sight. A refined walk with gentle folk and not a mutton vindaloo to be seen for miles – do you still have Miles in your employ? Wot no chips today? A lovely distraction on an otherwise worldly bad day! The riverbank is still looking green Mr Toad Beep Beep, Moley! Those sheep were awfully …smelly. I almost feel compelled to sneak down to their field tonight and shampoo them all, perhaps give them a trim and a pedicure. Farmers these days just have no idea. Miles sends his love. At least, I think that’s what he said. It’s so difficult to tell when someone’s chained up in the cellar, wearing an iron mask. Mumble mumble mumble. He’s down there because he over-topped one of the decanters last week. He can come back upstairs when he’s truly contrite.